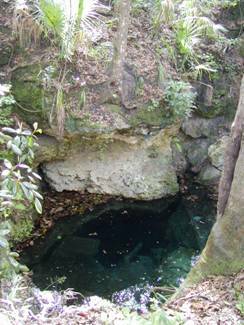 The entire state of Florida has a vast array of karst resources, ranging from sinkholes, to caves, to springs, to disappearing streams, to karst windows, etc. A karst window occurs where the aquifer is directly exposed to the surface. Because of this, there is no filtration by soil or bedrock for water that moves over the ground and into this ‘window’. The absence of any filtration means that contamination can occur easily, and the subsequent rapid transport of pollution throughout the aquifer puts our drinking water at risk and endangers the habitat for many species of rare animals. Apopka Blue Sink is a karst window, and in addition to being an indirect source of drinking water, it is home to a species of cave crayfish found nowhere else on earth, Troglocambarus sp. Karst windows are also hydrologically significant as they serve as recharge areas for our springs. 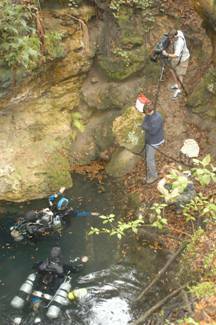 This means that precipitation rapidly enters the aquifer when it rains ‘on’ a karst window. It is important that watersheds where karst windows exist are retained as conservation areas so that pollutants are not introduced into the aquifer.